If you are considering choosing a dog between Alaskan Malamute vs Husky, you probably know it is not an easy task. These two breeds are quite similar, with probable size being the only difference. But that is not all. We can help you learn all about the Malamute vs Husky debate, all the differences, similarities, and of course, make an educated decision. So what is the difference between a Husky and a Malamute? Read on to find out. We suggest you get a notebook and note all the differences and similarities. That will make your decision easier. If you do it in a column format, by the end, you will have a simple graph showing you what are the pros and cons of each dog. Both breeds have a history of being ancient dog breeds. They are bred to live and work alongside people in cold and harsh climates. Their history of working as sled dogs dates back thousands of years. But there is one key difference here. The Malamute was bred to haul weight, while the Husky was bred to race. Some 4,000 years ago, the Alaskan Malamute became one of the first “man’s best friends”. Their origin is not quite clear, but many believe the Malamute is a descendant of the Mahlemut dog, which was founded by the ancient Inuit Tribe on the northwest of Alaska. The Mahlemut was used for hunting polar bears, seals, and other big animals, and then transferring them back home. Siberian Huskies were found in Siberia by the Chukchi people, also some 4,000 years ago. In the beginning, they were used for hunting, but more commonly for pulling loads over long distances through harsh environments. And lately, the Husky has been used for racing. Nowadays, both breeds are recognized by the American Kennel Club. As mentioned previously, one of the big and noticeable differences between these two is the size. When you look at the size of Malamute and Husky, you easily notice the former is larger. The Malamute is considered a large dog breed, weighing between 75 and 85 pounds on average, while the Husky is a medium breed with a weight of 35 to 60 pounds. You also have to consider the height of the dogs. The Malamute can reach 26 inches in height, while the Husky goes up to 23 inches in height. However, there is a Malamute that stands at 35 inches in height, called the Wakon Giant Alaskan Malamute. It is a separate breed. There is something about the eyes when it comes to Huskies we love. Huskies have unique eyes, and they can be brown, blue, or sometimes green. The Malamute has only brown eyes. Huskies are even known to have different eye colors. One of their eyes can be blue, and the other brown. But most commonly, huskies have startling ice blue eyes that make them unique and are loved by dog lovers around the world. Just looking at those eyes you are 100% sure to fall in love. Both of these breeds have thick, and double-layer coat that falls out two times per year, depending on the season. But they also shed gradually during the entire year. In terms of colors, the most common combination is a white face, belly, legs, and feet, while the markings can be black, brown, red, grey, or sable. One type of Husky, the Agouti Husky, is mostly black and grey in color, with only a hint of white on the chest and belly. Grooming needs are identical for both breeds. They require regular brushing and grooming to manage their shed hair and keep the coat healthy. However, being that the Malamute is larger in size, you will spend more time grooming him. In any case, you better invest in a good brush. You will have to brush them once or twice per week for sure. You can find just minimal differences when it comes to the temperament of these dogs. Both were bred to live and work in packs of people and dogs. They are both friendly and outgoing with their people. One small difference, the Malamute can be more aloof with strangers. The Malamute is also less friendly and tolerant of other animals. On the other hand, the Husky can accept newcomers easily and live with other family pets. Just remember, they were bred as hunting dogs once, which means they have a prey drive. Smaller animals can be problematic. Five characteristics that describe the Husky are outgoing, gentle, highly intelligent, very alert, and extremely friendly. On the other hand, the Malamute is known to be playful, extremely dignified, devoted, loyal to the pack, and affectionate. Are there good family pets? When you are looking for a family pet, you have to consider the guarding tendencies of Malamute vs Husky. These two breeds are vastly different in that regard. The Alaskan Malamute can have some aggressive tendencies and a high prey drive. He is less tolerant of other dogs. And while he is a big cuddly dog, the Husky is usually a better fit for a family pet. That is because while the Husky has high prey drive, it has a high tolerance for other animals, including dogs. Huskies are considered too friendly and outgoing to be good guard dogs. The Malamute is actually a guard dog. 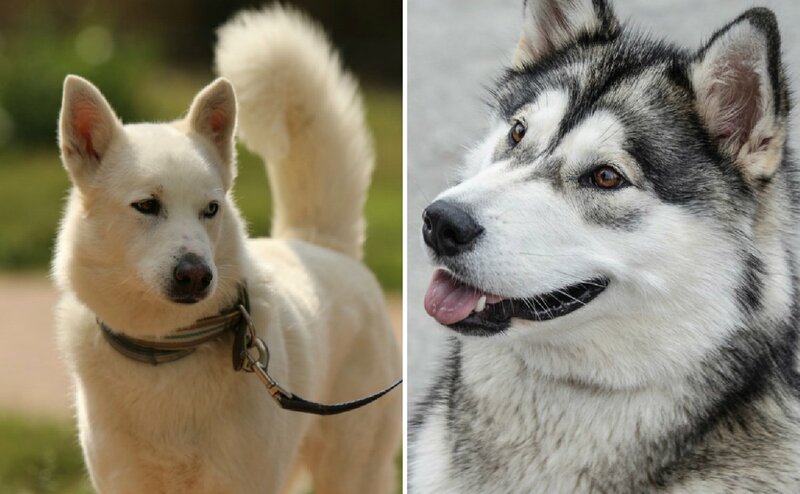 These two “winter” breeds are considered two of the most stubborn breeds. The Husky is notorious for being “difficult to train”. One simple explanation, huskies are pack dogs with a hierarchical order of leadership. That makes them stubborn, strong-willed, and independent. They only follow leaders, and if you cannot establish yourself as the alpha personality, you will have a hard time making your Husky to listens to you. But the Malamute is quite stubborn as well. And same as Huskies, they are pack dogs. When it comes to training of the Malamute, the first lesson is food training. You eat first, then the dog, the same as in the wolf pack. Give your dog only his own food. As powerful and independent dogs, the Malamute can be destructive and bored if not properly trained or exercised. Speaking of exercise, these two breeds are hard-working dogs. They need lots of exercises. Think at least 30 minutes of off-leash running and playing to burn off the dog’s excess energy. Training is best done after exercise, as your puppy will be more willing to listen to you after burning his/her energy. Now that we answered some of the questions you might have regarding Malamute vs Husky dilemma, the question is how long the dog will stick around. The Malamute has a lower average lifespan, ranging between 10 and 12 years. On the other hand, the Husky can live between 12 and 15 years easily. If you are a first-time dog owner, neither of these puppies might be right for you. Because of their stubbornness, they might not follow you as an alpha leader. It is hard to assert your authority when you are a first time owner. It is important that you train and socialize them early on. Being highly active, they need exercise on a daily basis. Last, but not least, these two breeds have two downsides. They are both diggers and will dig when bored. They love to jump and might jump over your fence. Last, but not least, same as wolves, they can howl at night, and you have to get used to it.